A characteristically anti-picturesque painting of the Malin Bridge, just outside Sheffield, this small landscape perfectly illustrates Priestman’s Realist approach to the English countryside. Like the Impressionists before him, he paints nature with all the human traces apparent upon it – the fences, telegraph poles, huts, quarries and industrial chimneys – at the same time that he produces perfect snapshots of the ephemeral effects of time and weather upon the light and colour of the scene. The clouds are particularly notable, reminiscent of Constable’s oil studies, and justifying Frank Brangwyn’s description of Priestman as ‘the finest sky painter of our day’. Priestman, however, never worked these sparkling studies up into grand machines, as Constable did in his studio; in consequence they retain the freshness and authenticity of the moment of their creation. Bertram Priestman was born in Yorkshire in 1868, the son of an art collector and Bradford businessman. After travelling to Egypt, Palestine and Italy, he trained at the Slade School of Art, and with Edwin Moore and Arnesby Brown. He first exhibited at the Royal Academy when aged 21 (a portrait of a Chelsea pensioner), but then failed to have his work accepted for the next six years, turning instead to the New English Art Club and other galleries. He became a studio assistant to William Llewellyn, later president of the Royal Academy. He was elected a member of the R.A. (1923), the Royal Institute of Oil Painters and the Royal Society of British Artists, also exhibiting at the Goupil Gallery and Walker Art Gallery, Liverpool. He taught artists including Edward Seago at his Walberswick studio. Frank Brangwyn called him ‘the finest sky painter of our day’. 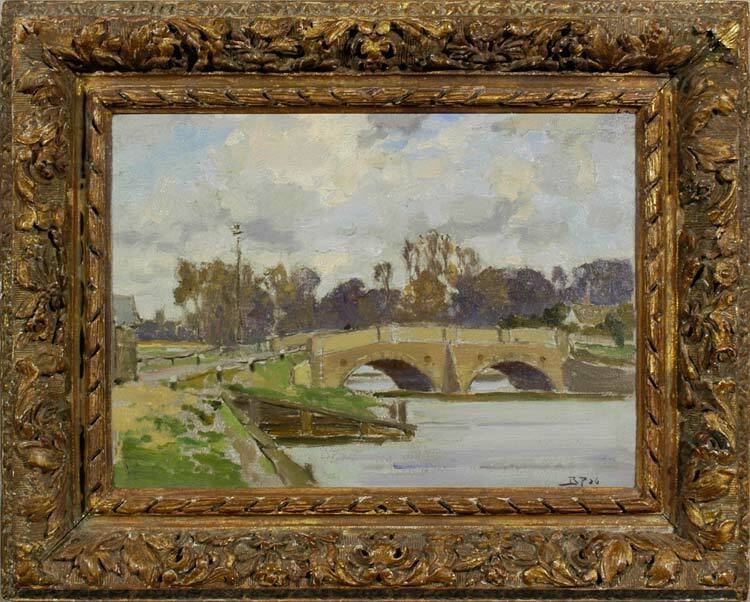 Works in public collections include Folkestone boat train, Folkestone Museum; Sunset and smoke over Rochester, Guildhall Museum, Rochester; Swollen waters; Landscape and telegraph poles; Twyford Lock; and Morning, Leeds Museums & Galleries; Walberswick Marshes and The port of Ipswich, Suffolk; Blythburgh from Henham, Worthing Museum and Art Gallery; A hazy day on the Rochester river, Valley pasture: marsh meadows, The heart of the West Riding, Dales landscape, Buckden Vale, River scene, Arnold Priestman sketching, and His Majesty’s mail, Kilnsey Crag, Bradford Museums & Galleries; and Hulks at the water’s edge, Coniston Old Man, and five other works, Kirklees Museums and Galleries.